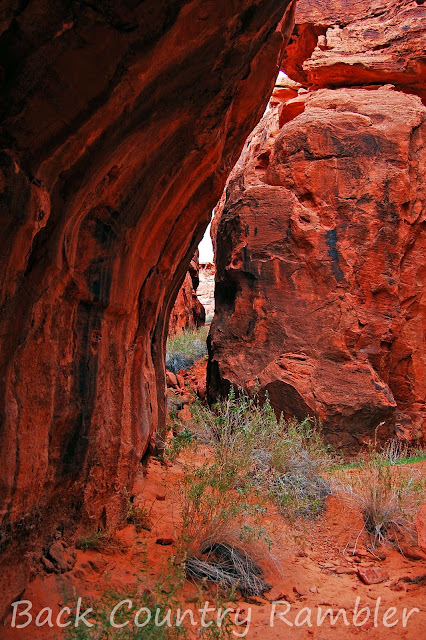 The Gold Butte region is filled with amazing geologic and natural wonders as well as many cultural heritage sites. Many of these back country destinations are labeled with descriptive names that give the particular site and added sense of marvel. Devils Throat is no exception to the list of Back Country marvels found in Gold Butte. This geologic formation was most likely created when circulating ground water eroded and displaced much of the earth deep beneath the surface. The thin crust that was left above became too week to support its own weight and gave way to create what is now known as Devils Throat. The sinkhole that was left behind is approximately 75 feet across and roughly 120 feet deep, however the bottom of the sinkhole is angled from one side to the other so it varies from one side to the other quite a bit. Once you hit the end of the pavement at Whitney Pockets (click the link for directions to Whitney Pockets) it is another 8 miles down the rough and dusty road towards Devils Throat. Devils Throat is an amazing sight just off the main road to Gold Butte Headquarters and the graves of Art Coleman and William Garret. You will see a sign that directs you to Devils Throat and Red Bluff Springs on the right hand side (west) when coming from Whitney Pockets. There is now a fence around the sinkhole but back when Gramps was running cattle through this country this was an area to be avoided when looking for lost cows late into the deserts setting sun. Like Willie says it’s been rough and rocky travelin’ but the ride out to Devils Throat and the other vicinity destinations in and around Gold Butte are well worth any Back Country Ramblers time. The red and white sandstone hills that make up the desert landscape of Gold Butte are filled with thousands of rock engravings. These petroglyphs or rock engravings were carved by a people who inhabited this area long ago. The Luke Whitney Petroglyphs is an area that contains many of these petroglyphs. 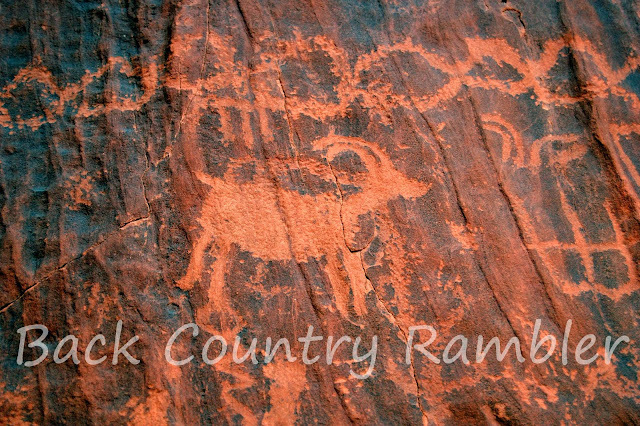 These petroglyphs are one set of rock art that is a must see if you are in the Gold Butte area. The Luke Whitney Petroglyphs are truly amazing. There is one particular set of petroglyphs found at Luke Whitney that has taken on the name of News Paper Rock. 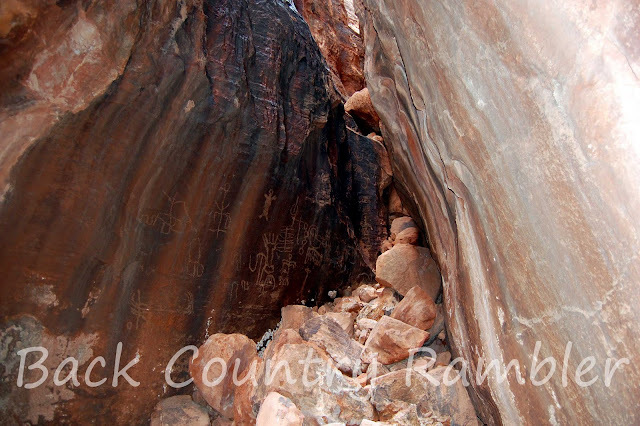 News Paper Rock is a sheer red sandstone outcropping packed with these ancient people’s carvings. Many of the flat faced sandstone surfaces in the Luke Whitney Petroglyphs area are covered with a similar style of petroglyphs. The sandstone outcroppings found in the Luke Whitney Petroglyphs area are brilliantly painted with the deserts rich colors. If you are willing to get out and hike a little through the slots, canyons, hills and cliffs in this area you will be treated to some of the greatest petroglyphs in this part of the country. 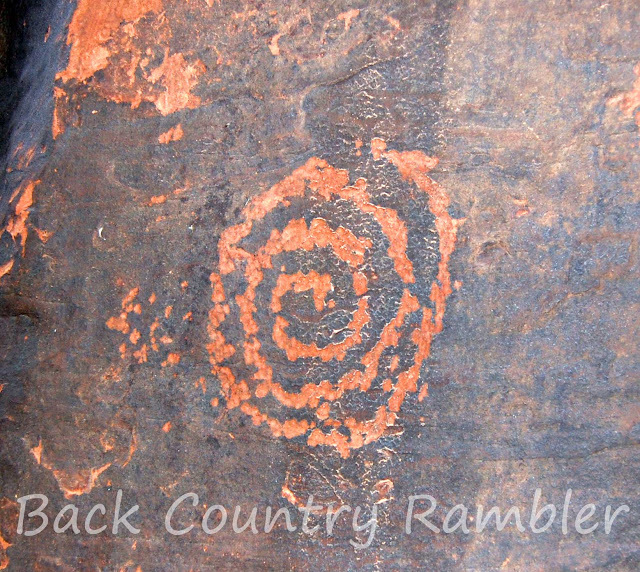 The Luke Whitney Petroglyphs can be found just 25 miles off of I-15. The last two miles is a dirt road that turns off of the Gold Butte Road. The road is rough and a high clearance vehicle is a must but in good weather conditions a four-wheel drive would not be needed. There is no sign marking the turn off but when you see the first big outcropping of red sandstone start looking for a dirt road that turns off on your right. Please when visiting this back country be smart and use your head. Don’t put yourself in a situation where bad weather or some other mishap like a flat tire or vehicle problems will leave you stranded and in trouble. This is rough country and you should come prepared. The best time to visit is in the spring and winter. As an understatement the summers are hot and dry. Please have respect for our country’s heritage. Stay on existing trails and do not deface or damage the petroglyphs in any way. The way we keep our back country open to enjoy is to respect and help protect what is our greatest treasure, our public lands. Cedar Basin is tucked within one of the many mountain ranges of the Gold Butte country. Within this basin there are stories of hidden Spanish treasure, mining, cattle ranching, and drug smuggling to name a few. Like many of the places that I write about in Back Country Rambler, Cedar Basin is filled with a natural desert beauty and topped with a rich chronicle of human and natural history. On the eastern side of Cedar Basin is Grapevine Springs. Grapevine Springs is actually more of a catch pond for the early desert Spring rains than it is a spring. This catch pond was used to support the cattle herds that were run through this country in years past. My grandfather was one of the cowboys who ran cattle through the Gold Butte grazing allotment in the 1970’s and early 1980’s. Gramps says about the Gold Butte grazing allotment that “the cactus done well and they made a little money selling rough stock for the rodeos in Salt Lake.” Cedar Basin was normally used for early spring range when the pond was full and you needed a good coral to work the spring calves. Mining has also played a part in the history of Cedar Basin. On the maps the Radio Crystal mine is marked as the largest mine in the basin. However today the mine is know as the Treasure Hawk mine run by the Cutthroat mining company. From the little that I know about the place and from talking to people around it sounds like the Radio Crystal Mine or the Treasure Hawk mine was after silver, lead and zinc. The most recent owner of the claim was John Lear. I ran into him and some of his friends out there when I was visiting Grapevine Springs. They seemed like good enough folks. Lear lost the mining claim a few years ago and is now charged with cleaning the place up. There are still some buildings there and some old equipment and shafts here and there. If you plan on visiting this old mining claim use your head and watch your step and as the Bureau of Mines says, “Stay out and stay alive.” For more information about John Lear and his take on the country you can visit his site by clicking here. One of the other many attractions of Cedar Basin is the stock corral and the landing strip located in the center of the basin. This corral was used in years past for working the spring calves. The airport however has an interesting story of its own. In the 1960’s and 70’s the Radio Crystal mine was run by a little more crooked outfit. Now the exact details about this whole operation are a little shady so this is the story as I have pieced together by people that I know who were in the Gold Butte Country at the time. It is rumored that the people who where running the mine in those days were possibly growing some agricultural products that were not exactly legal, then or now. These people were also connected with an outfit from Mexico who smuggled more “agricultural products” in by plane to the Cedar Basin landing strip. Some of the locals out in the country at the time knew what was going on but also knew to stay away. My father in law was an occasional hand on some the spring and fall gatherings and remembers being told to stay out of the basin when certain operations were going down. Eventually the authorities stepped in and the operation was stopped. The details about the buried treasure, as treasure stories always seem to be, are a little sketchy. However I have heard about it from two difference sources so I will share what I have heard. It is a well known fact that the Spanish explored this country in earlier times looking for gold. There are remnants of their explorations and mining efforts scattered all through out this state and much of the west. In the hills of Cedar Basin there is evidence of their explorations and mining ventures. It is rumored that the Spanish left some gold in these hills for a time when they could come back and get it another day. It is supposed to be marked by a petroglyph, however I have yet been able to find the marking or the treasure. Cedar Basin can be found near what is now called the Gold Butte Back Country Byway. 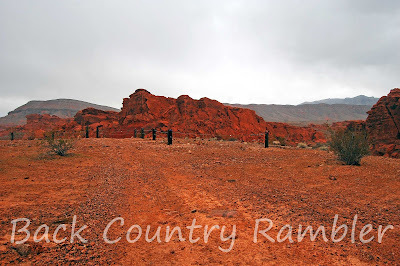 Once you get to Gold Butte Headquarters you continue down the road roughly two miles and then turn left and head up the wash to enter Cedar Basin. To view a map of the area check out my Trip Map page and click the button under the map labeled Cedar Basin. As always, use your head when out in the back country and don’t put yourself in a situation that can leave you venerable to Mother Nature’s untamed power. This is a rough road in rough country. You will most definitely need a high clearance vehicle and four-wheel drive is advised. However the sites are worth it and the country is grand. Enjoy it while you can. Hidden amongst the colorful desert landscape of gold butte, Nevada is a canyon that I can easily call my favorite. 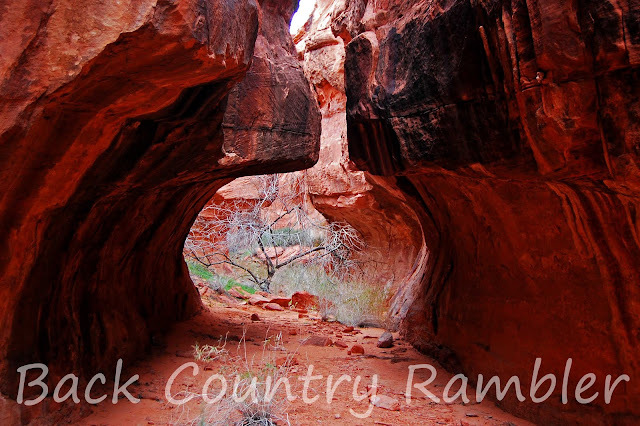 Keyhole Canyon is a slot canyon carved through a red sandstone island near the confluence of Gold Butte Wash and Mud Wash. Encapsulated within these red desert cliffs are writings from a time gone by. While hiking through these sandstone walls, in search of the Indian writings, it is easy to find ones self slipping back in time. Check out the Interactive Map to see the location of Keyhole Canyon. Uncle Bert had heard about these petroglyphs from one of his Perkins relatives. The only direction he gave to Keyhole Canyon was, “it is in some red rocks below the corral but above Red Bluff Springs.” With this tidbit of information Dad and Bert set out in search of this red slot canyon and the Indian writings within. Over the years we searched many slots, cracks and canyons within the red rock islands near Gold Butte Wash, but to no avail. 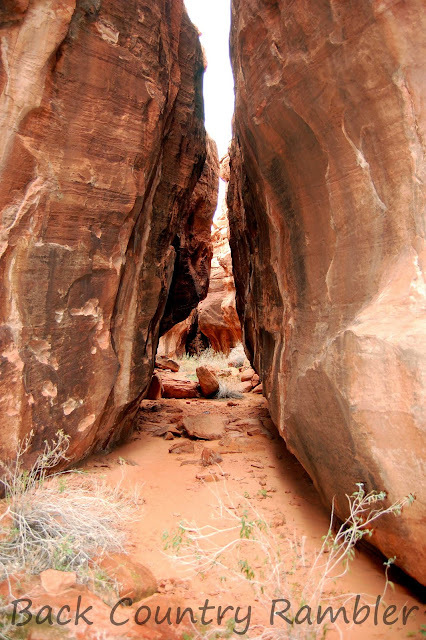 Finally we stumbled across the slot canyon that became known as Keyhole Canyon. What a discovery! There was nothing but a few rodent tracks, catclaw bushes, and some Indian writings on the desert varnished walls. 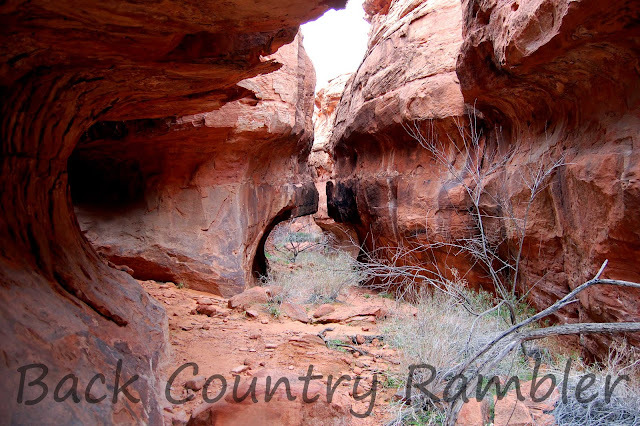 Uncle Bert actually named this slot canyon on the first visit while eating lunch outside its entrance. It is not hard to see why he named it Keyhole Canyon after one visit to this spot. To enter Keyhole Canyon you have to first make it around a large catclaw bush. This is actually one of the reasons it took us so long to find the canyon. If you have ever fought a catclaw bush you pretty much know it’s a losing battle attacking from any angle. It is not called the Wait-a-Minute bush for nothing. Once you make it around this formidable desert plant you enter the first section of the slot canyon (for future visitors the catclaw bush has been pushed back by the droves that now visit). The first section of this slot canyon is circular in shape, carved by years of Mother Nature working away at these desert rocks. After about 15 yard through the first section of the keyhole, it then opens up where two tributary canyons angle into the main part of Keyhole Canyon. After this brief opening the canyon then narrows down and the cliffs become steeper. After roughly 30 yards the slot canyon starts to narrow quickly and then the canyon ends at a rockslide. 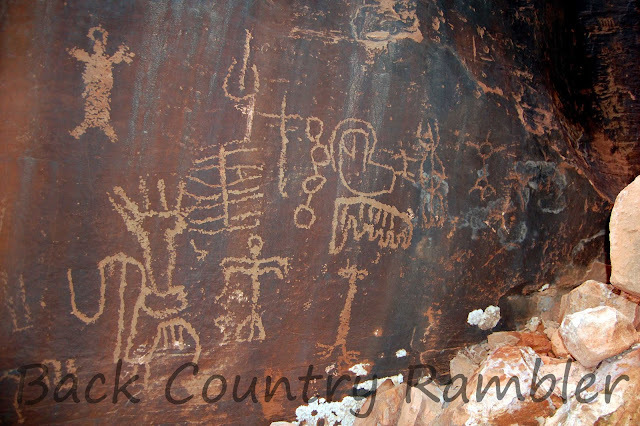 It is at the rock slide, on the desert varnish walls, that Keyhole Canyon petroglyphs begin. When standing at the entrance to Keyhole Canyon if you look east there is another set of petroglyphs under an overhang of the red sandstone cliffs. These Indian writings are on a large rock that looks like it was broken off of the face of the cliff many years before. 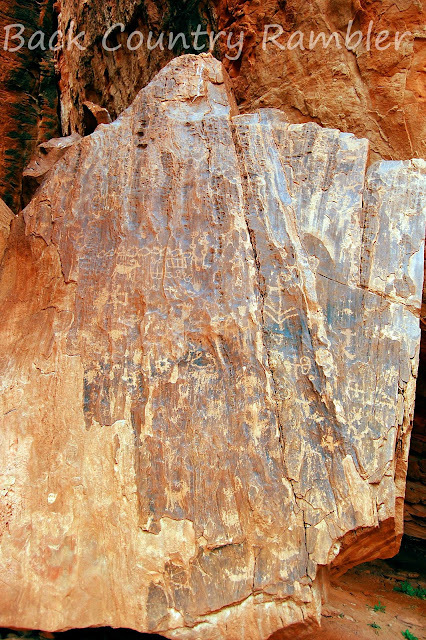 There are actually more Indian writings on this rock then there are in Keyhole Canyon. There are other Indian writings hidden within the slots of these canyons that are less known. One of my favorites is a lone petroglyph hidden is a narrow slot within these same sandstone islands. This slot is so narrow that you literally have to turn sideways to get back to the end. Once you reach the very end the slot opens up into a large room. To me it seems like a place where these ancient people would gather. 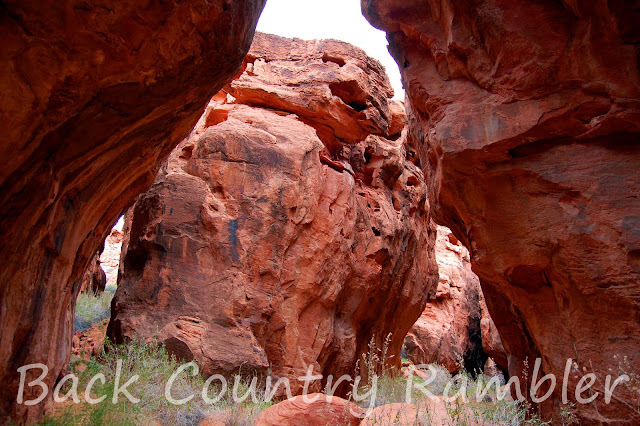 Like all of the Gold Butte country there is plenty to see and visit within the close vicinity of Keyhole canyon. To get to Keyhole canyon leave Whitney Pockets and head down the road to Devils Throat. Once you get to the Devils Throat turn off turn right, towards Devils Throat. Because you are so close take the two minutes and stop and see devils Throat. Keep driving down the same road, the signs will say Red Bluff Springs. It is about 9 miles from the Devils Throat turn off to the corral. From the corral it is about 1 more mile down to where the Gold Butte Back Country Byway hooks into Mud Wash. At that intersection you will see an island of Red Rocks. You will see a road that leads over to the last island. Take that road and you will find the BLM corral blocking the last half mile of the road. Much of the Gold Butte area is getting closed to the public. The time to visit and get involved in keeping these places open for public enjoyment is now. Be prepared to run into BLM road blocks and No Motor Vehicle signs. They are litter the desert at every turn. When out visiting our beautiful country use your head and don’t do things that would give the BLM a reason to close even more places off. It is our country to enjoy but also take care of.